Your business plan is written, your funding is secured and your market opportunity is in front of you, waiting to be launched. All that remains is to incorporate your business and hit the ground running. For many entrepreneurs, startups and company founders, this presents a dilemma: you want to build your business on a solid legal foundation to avoid problems down the road, yet you also want to direct as much of your limited resources toward operations rather than expensive legal services at this early stage. We recognize the challenges that many entrepreneurs, startups and founders face prior to engaging legal professionals to help launch their business, from not knowing where or how to begin to the uncertainty of costs and what they may or may not need. 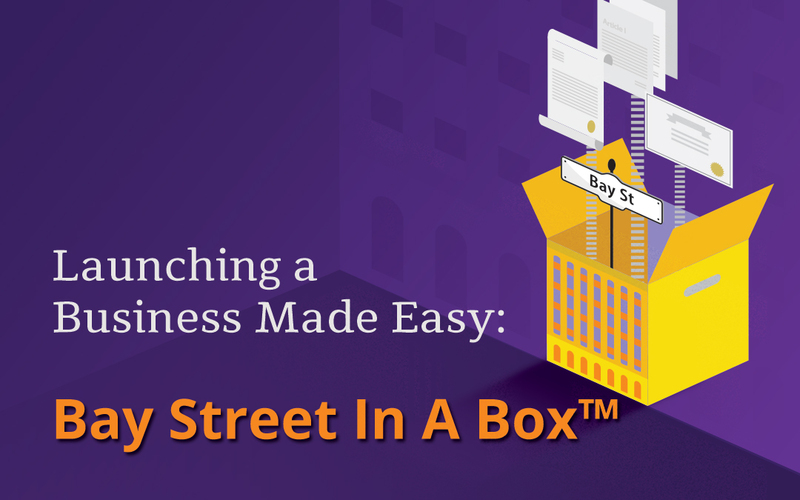 We’ve designed Bay Street In A Box™ to address these challenges, save you time and money while providing peace of mind. Incorporation is a key step in setting up your business. For many consultants and sole proprietors, incorporation is the next step to solidify what you’ve built. Incorporating your business offers both legal and tax advantages. Many Canadian business owners attempt to incorporate their business themselves, without hiring a lawyer. Legal fees can be unpredictable – especially when the final invoice depends on how many billable hours it takes your lawyer to complete the job – so we understand why many are hesitant to work with a lawyer during this process. 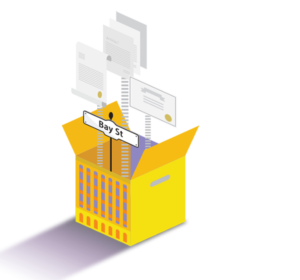 With Bay Street In A Box™ the comprehensive incorporation process is transparent, efficient and inexpensive. What you pay is fixed from the get-go. No uncertainty, no extra charges. And our fee represents a 50% discount relative to what a traditional Bay Street law firm would charge for the same work. Bay Street In A Box™ is a one-stop shop for your initial corporate legal needs. Everything you need to incorporate your business in Canada – nothing more, nothing less. You will receive the full suite of legal documents and advisory services required to incorporate your business, including articles of incorporation, bylaws and organizing documents, employment agreement, stock option plan, and more. We’ve assisted businesses in industries ranging from food and beverage to mining, technology and everything in between during their incorporation process. We promise we know what you need today, tomorrow and as your business grows. We don’t just want to prepare legal documents for you; we want to see you succeed. We will take the time to understand your needs and determine the necessary legal documents for your business during a complimentary initial consultation – either in-person or via a telephone/video call, depending on your preference. You’ll also receive up to 3 hours of follow-up support to answer your legal questions and concerns. As a business owner, you don’t want any surprises. With Bay Street In A Box™, we promise just cost-effective, high-quality service. If you’re already incorporated and operational, congratulations! You can still benefit from our transparent approach and reasonable fixed fees for assistance with other transactions, such as the Bay Street In A Box™ seed financing and employee stock option plan packages. If you don’t need a comprehensive set of documents for incorporating your business, simply choose the ones you want. This a la carte approach still gives you peace of mind with a fixed fee and no surprises, as well as a complimentary initial consultation (in-person or via telephone/video call) and 1 hour of follow-up support. 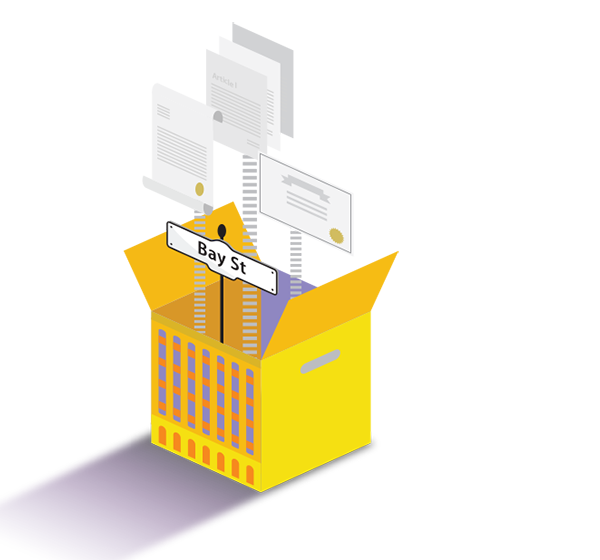 Upload your business information into our fully automated Bay Street In A Box™ interface on the Aluvion website. One of our lawyers will contact you for an initial consultation within 24 hours. We will review all your information and prepare the appropriate documentation. One of our lawyers will walk you through all the documents and address any follow-up questions or concerns that may arise. With Bay Street In A Box™, we give you the legal services you need, delivered quickly and efficiently by our team of knowledgeable lawyers for a fixed fee. Less money spent on incorporation, more money invested into your business. Professional legal services without the billable hours. This is what Doing Legal Differently™ looks like. Contact us to find how Aluvion can help you launch your business.